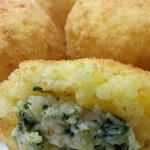 Mozzarella and Burrata Cheese (burrata cheese is fresh mozzarella cheese with cream in the center) combined and surrounded by Arborio rice. 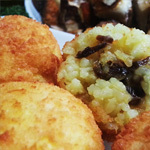 The rice is formed into balls, rolled in bread crumbs and fried. 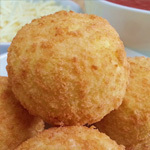 Arancini make a great hors d'oeuvre, but they're so good you might just eat these instead of dinner!